Audyssey has announced the Audyssey Audio Dock: South of Market Edition, which features an appealing, slim design and Bluetooth connectivity that enables audio streaming from any Bluetooth-enabled device—including the iPhone. Behind the Audio Dock’s grilles are a pair of 4-inch woofers and 3/4-inch tweeters. The system is bi-amplified, just like professional studio speakers, and the sound quality is enhanced by five of Audyssey’s proprietary technologies: Audyssey Dynamic Voice, Audyssey EQ, Audyssey Dynamic EQ, Audyssey BassXT, and Audyssey Dynamic Volume. These technologies work together to produce high quality sound for both music and phone calls. The Audio Dock also features microphones mounted on the front and back, which allow it to be used as a Bluetooth-enabled speakerphone. 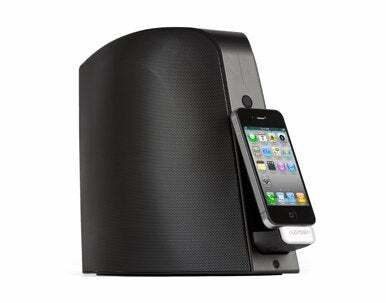 And with its included remote control, the Audio Dock can answer calls from across the room with the push of a button. The Audyssey Audio Dock: South of Market Edition will begin shipping in the fourth quarter of this year and will have a street price of $399.